Not many countries can claim to have been using space for 50 years but it was in 1962 that the Andøya rocket facility in Norway launched its first rocket. This weekend Norway is celebrating its anniversary with His Majesty King Harald and ESA astronaut Christer Fuglesang amongst others. Norway’s northern territories are well placed for a launch facility. Over 1000 sounding rockets have been launched from Andøya including ESA’s own microgravity experiments. Offering over six minutes of precious experimentation in weightlessness the rockets lift-off and land in the North Atlantic within quarter of an hour. Even further north, the islands of Svalbard host Galileo’s largest ground station relaying information and commands to Europe’s satellite positioning system. Svalbard also has the largest ground tracking station for polar orbiting satellites. Of all Earth’s landscapes, many experts consider the islands of Svalbard to resemble Mars the most, so many missions to Mars are tested there before they are sent to the Red Planet. 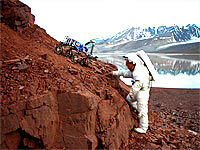 Two instruments on NASA’s Curiosity Rover that landed on Mars last week were put to the test on Svalbard’s landscape. Norway’s claim to space is not only based on its geography. ESA welcomed the country to its member states in 1987. Norwegian companies have supplied hardware for a wide range of missions and equipment. All Ariane-5 rockets rely on Norwegian-made explosive bolts that separate the fuel tanks from the main thrusters. Due to Norway’s large shipping fleet the country has always been at the forefront of telecommunications. Many satellites launched today use Norwegian electronics. Air monitors built in Norway have been a success on the International Space Station, and chambers for growing plants in the Space Station’s greenhouse were also developed there. To reflect on these achievements and to look towards the future, the Norwegian Space Centre has organised a four day programme of talks and festivities including open days of the Andøya rocket facility. For more information see the links to the right.